I installed lotus notes 8.5.2 on 10.10 netbook using unity desktop. At first lotus notes showed its menu. Suddenly (not sure if I did something) the menu disappeared. When I start up using gnome desktop, the menu still is there. Unity shows only the file menu for notes with the only entry for closing notes. Use VI to edit the following file: sudo vi /usr/lib/gtk-2.0/2.10.0/menuproxies/libappmenu.so. Search for Eclipse (type /Eclipse) and replace the E character with an X (type rX). Save it (type :wq) and run sudo ldconfig. This is a reported bug in how SWT applications (like Eclipse and Lotus Notes) handle the appmenu. 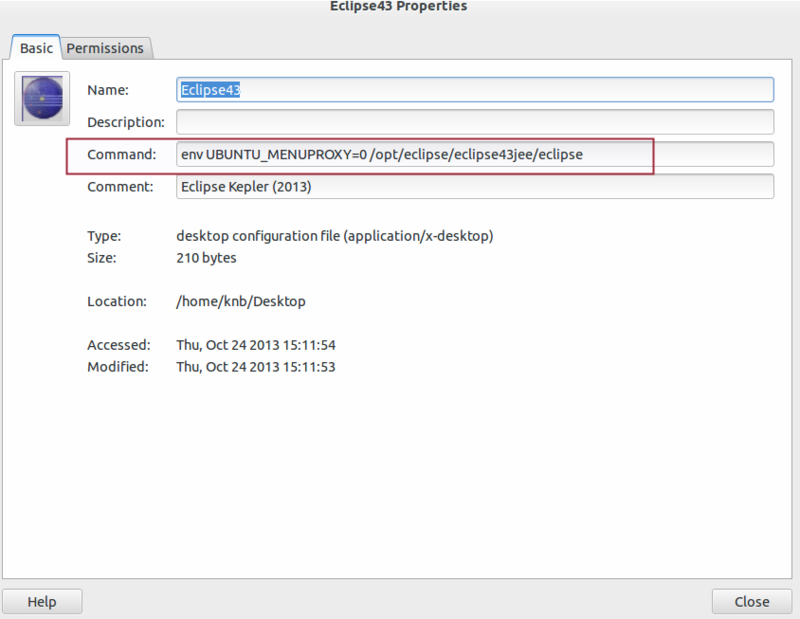 If you installed eclipse with Software Centre, then use which eclipse to determine the path. Make that file executable and try running it. You can use "Main Menu" (search in the Dash) to create a launcher for it so it shows up in the Dash. That should move the menus from the Unity top bar to the eclipse window. Once the bug is fixed, you will be able to run eclipse normally. Another question has a much more thorough description of disabling appmenu for any application. Finally, just save by writing this: ZZ. In caps, so you should do SHIFT+Z SHIFT+Z! Can I make Eclipse use the Ubuntu global menu? Put Eclipse Menubar in Globalmenu? Is it possible to make indicator-appmenu ignore a specific application? How do I mark a file as executable via a GUI? Is there a way to add a main menu button to the unity panel?